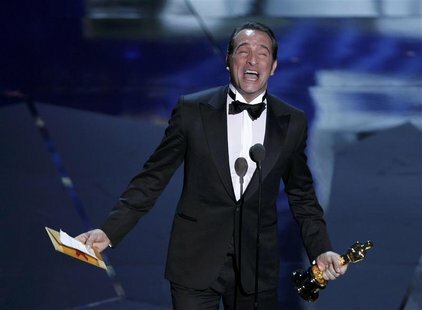 As widely expected, it was The Artist’s night at The 84th Annual Academy Awards, as it won five awards, including Best Picture, Director, and Actor for Jean Dujardin. However, the Academy also showed its affection for Martin Scorsese’s Hugo, which also won five awards in technical categories. Meryl Streep, Christopher Plummer and Octavia Spencer won the other acting awards. Despite having won every award under the sun, all of The Artist’s winners were deeply moved and all utterly charming, and, as has been the fashion this year, delivered cinephile acceptance speeches. Dujardin thanked Douglas Fairbanks and said to the audience “I love you’re country”. He later confirmed that he did drop the French equivalent of the F-bomb in his speech. When director Hazanavicius and producer Thomas Langmann accepted the Best Picture award, Langmann thanked Claude Berri, the director of Jean de Florette, and Hazanavicius thanked three people “Billy Wilder, Billy Wilder and Billy Wilder”. The only small surprise came in the hotly contested Best Actress category, where Meryl Streep won her third Oscar, ahead of Viola Davis, who had become the favourite over recent weeks, for her flawless portrayal of Margaret Thatcher in The Iron Lady. Accepting the award to a huge standing ovation, Streep said “When they called my name, I could hear half of America going “Oh, no. Oh, come on. Her again?” But, whatever.” She later acknowledged that she knew “she was never going to be on this stage again”, and joked backstage that two of her fellow nominees hadn’t been conceived when she last won an Oscar. Christopher Plummer, who won for his role as an elderly man belatedly coming out as gay in Beginners, delivered the most wonderful speech, turning to his long-awaited Oscar and saying “You’re only two years older than me, darling. Where have you been all my life?” Having received a standing ovation, he joked that he has been practicing his acceptance speech since he was pulled from his mother’s womb, “but, mercifully for you, I have forgotten it”. He became, at 82, the oldest Oscar winner ever. Other highlights included Bret McKenzie, from Flight of the Conchords, winning an Oscar for Best Song for “Man or Muppet” from The Muppets and Woody Allen (not in attendance) winning for Best Original Screenplay for Midnight in Paris. Before the evening got going, Sacha Baron Cohen arrived on the red carpet dressed as The Dictator, and spilt the ashes of the late Kim Jong Il on the carpet, and on Ryan Seacrest, to the delight of the twitterati.